The lack of an atmosphere on Mars and the fact that on the Red Planet there was no water and no active volcanoes raised a few eyebrows when the cloud was spotted. 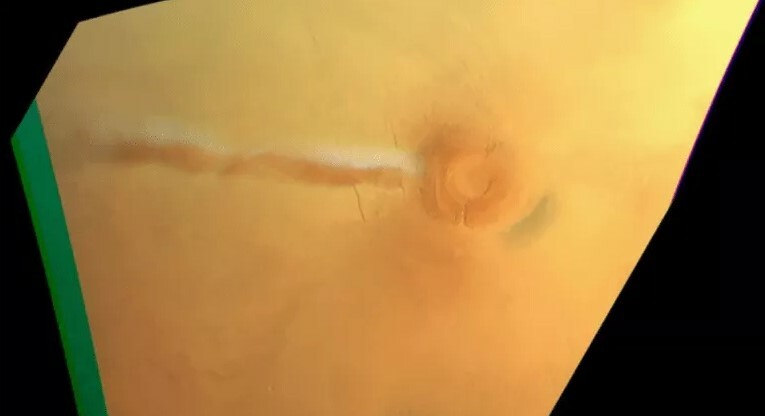 The European Space Agency released an interesting photo captured by the Mars Express orbiter. [It certainly gave every superficial appearance that the volcano was about to blow, though that would be curious, as the estimated date of its last eruption was about 50 million years ago]. It turns out “there’s a much simpler explanation than Arsia Mons roaring back to life, per the New York Times: a routine meteorological phenomena called orographic lifting. That’s when wind hitting a massive structure such as a mountain—Arsia Mons in this case—is forced upwards, cooling and expanding due to lower atmospheric pressure. As a result, water vapor contained within can condense and freeze into clouds”, mentions gizmodo.com. Dr. Noe Dobrea said this was clearly not a volcanic event, because spacecraft would have detected a rise in methane, sulfur dioxide and other gases that spill out of eruptions. Instead, this is an example of how topography affects weather. … Indeed, it is rare for there not to be clouds over Arsia Mons. More than a decade ago, Dr. Noe Dobrea analyzed observations from an earlier NASA mission, Mars Global Surveyor, trying to piece together a cloud-free picture of the Martian surface. But every time the spacecraft had passed over the western flank of Arsia Mons, it was cloudy. “It turns out not a single one of the observations ever had a clear view of the surface at this point,” he said. Where Will the ExoMars 2020 Mission Land?